American’s may love store bought pies and basic homemade cookies, but this Thanksgiving they can opt for more unique desserts that are sure to become the new holiday hit. 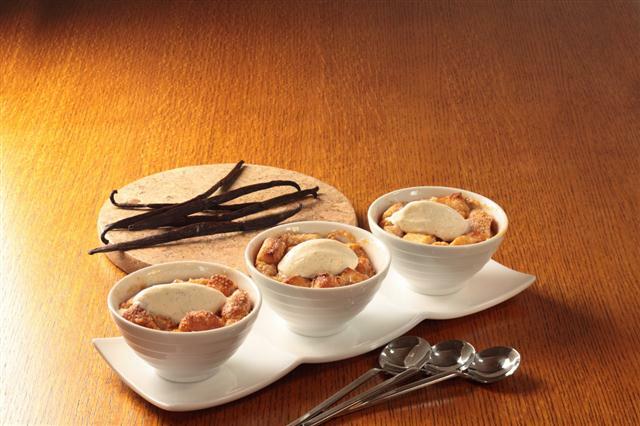 Nielsen Massey Vanillas’ Banana Bread Pudding with Vanilla Bean Ice Cream recipe, found below, combines the savory flavor of Nielsen-Massey’s Madagascar Bourbon Pure Vanilla Sugar and Bean Paste with the soft, sweet taste of bananas and spice of cinnamon. Don’t forget to top it with vanilla ice cream to create a treat that is the perfect mixture of warm and cold. Nielsen Massey Vanillas’ Banana Bread Pudding with Vanilla Bean Ice Cream recipe, found below, combines the savory flavor of Nielsen-Massey’s Madagascar Bourbon Pure Vanilla Sugar and Bean Paste with the soft, sweet taste of bananas and spice of cinnamon. I’ve never had a bread pudding before, but always wanted to try one. This looks amazing.